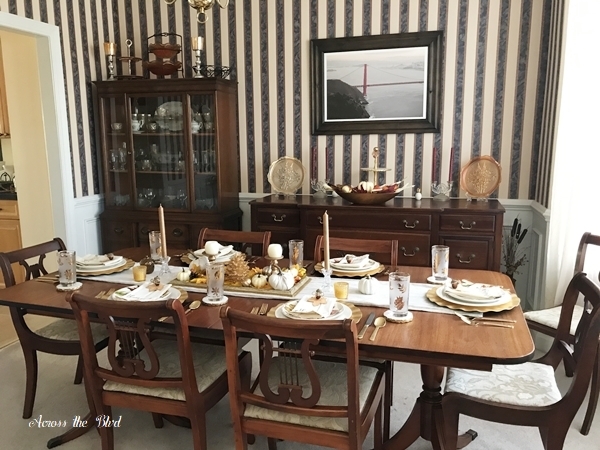 It’s getting close to Thanksgiving so that means it’s time to dress up our dining table for the holiday. 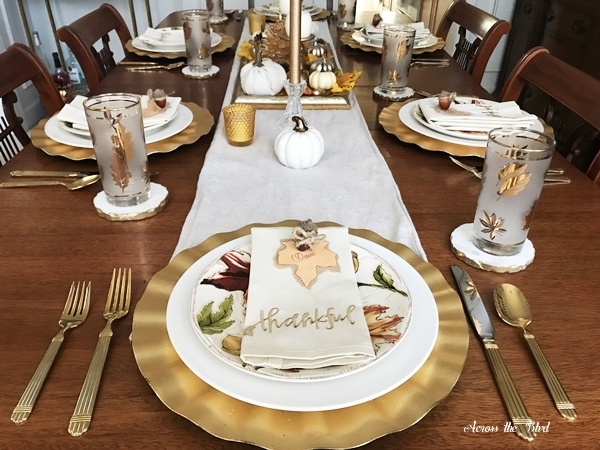 We don’t have a large gathering for Thanksgiving, but I like to set a pretty table with place cards. For holiday gatherings, having place cards just adds a little something special to the tablescape. 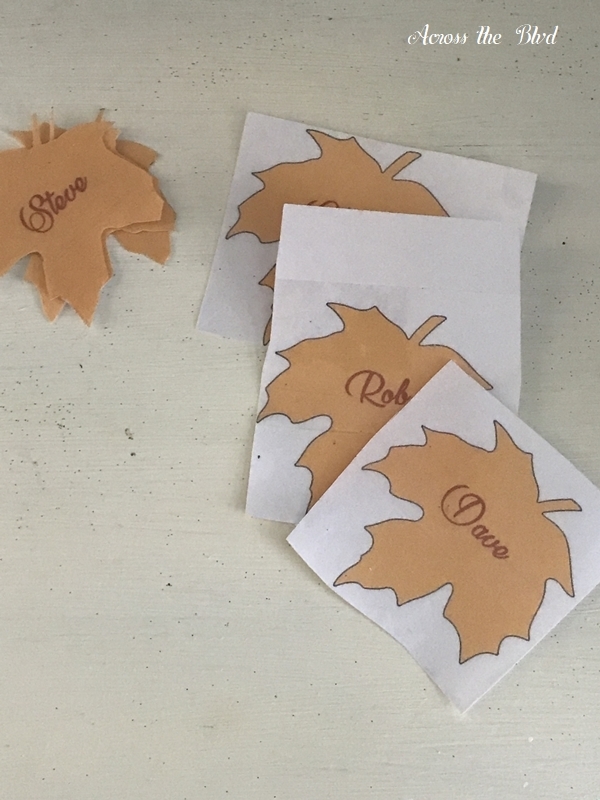 These acorn and leaf place cards are easy to make and only take a few minutes. I gathered the supplies needed for the place cards. Pictured below: twine, acorns, printed paper leaves. 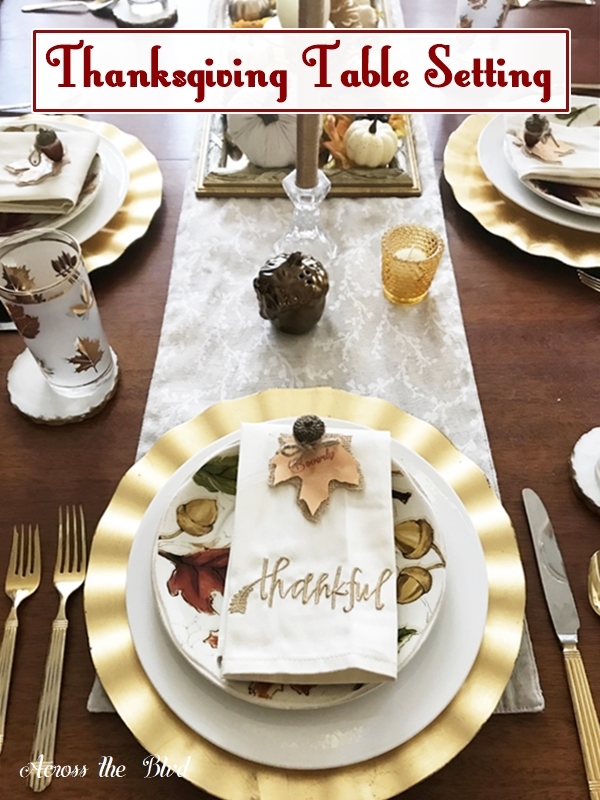 I found a leaf template online and using a downloaded program called PhotoFiltre, I added color and used a pretty font to add the names of our Thanksgiving guests. The leaves were inserted into a word document for easy printing. Once they were printed, I used clear packing tape for a makeshift way to laminate the leaves. I covered the front and back with tape and then trimmed the excess from the leaf shape. If you have acorns in your yard, you could clean those and use them. I don’t have any, so I purchased a small bag of decorative ones at Jo-Ann Fabric and Crafts. 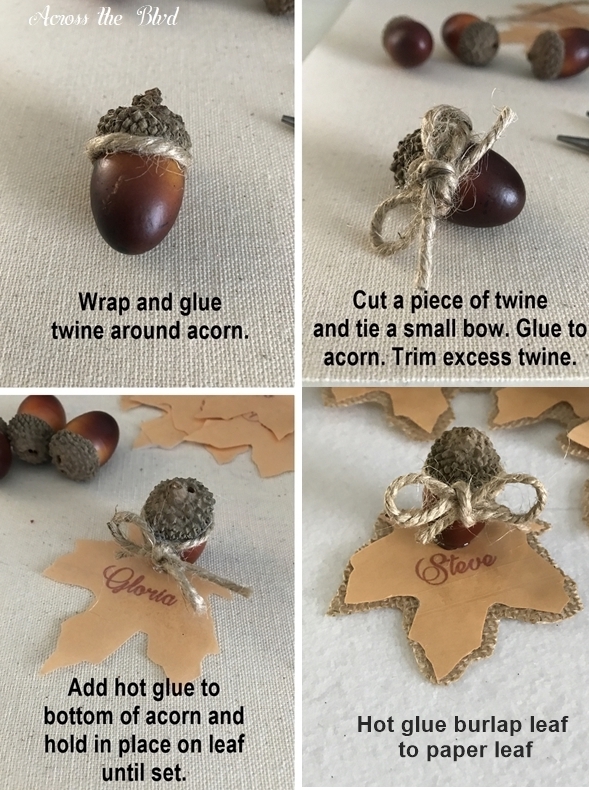 Cut a small piece of twine and wrap it around the acorn and secure with hot glue. Using a second piece of twine tie a bow and glue that to the twine already on the acorn. Before adding the acorn, (I didn’t decide to use the burlap until after I had added the acorn) cut a piece of laminated burlap using the paper leaf as a guide. Make the burlap leaf just a little larger than the paper leaf. Glue the burlap leaf to the paper leaf. Glue the acorn to the leaf. Make sure to hold it in place for about 30 seconds to secure it. 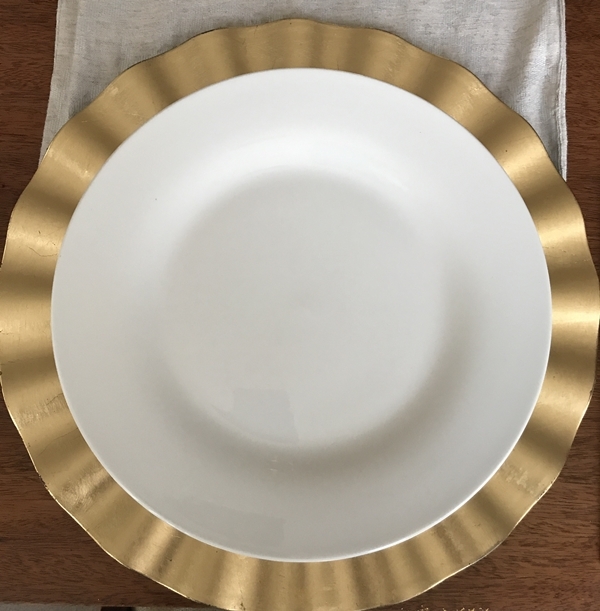 Each place setting has a gold charger that I purchased at Marshall’s last year, but I recently saw some pretty gold ones at the Dollar Tree. 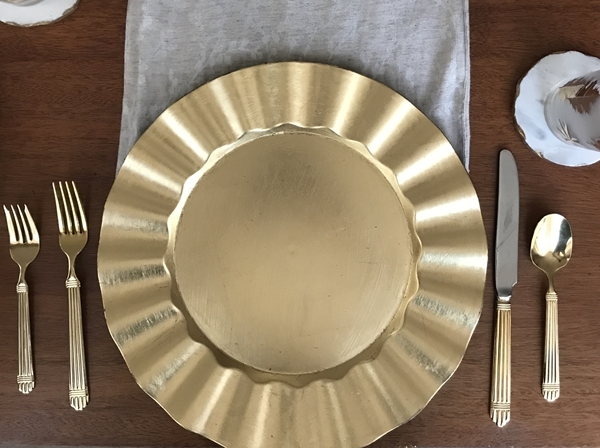 I like using our gold flatware for Thanksgiving. Instead of using the china that I usually use for Thanksgiving, this year I decided to switch things up. I’m using plain white dinner plates from The Dollar Tree. 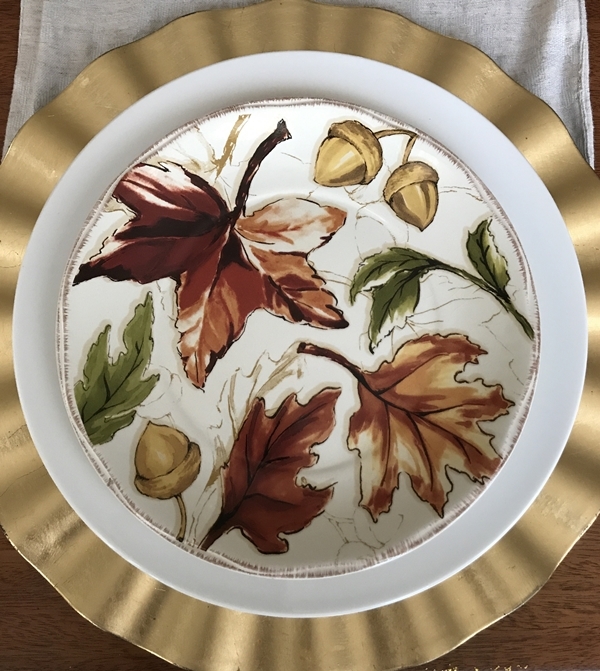 The dinner plates are topped with Better Homes and Garden autumn themed salad plates. These were purchased a few years ago at Walmart. 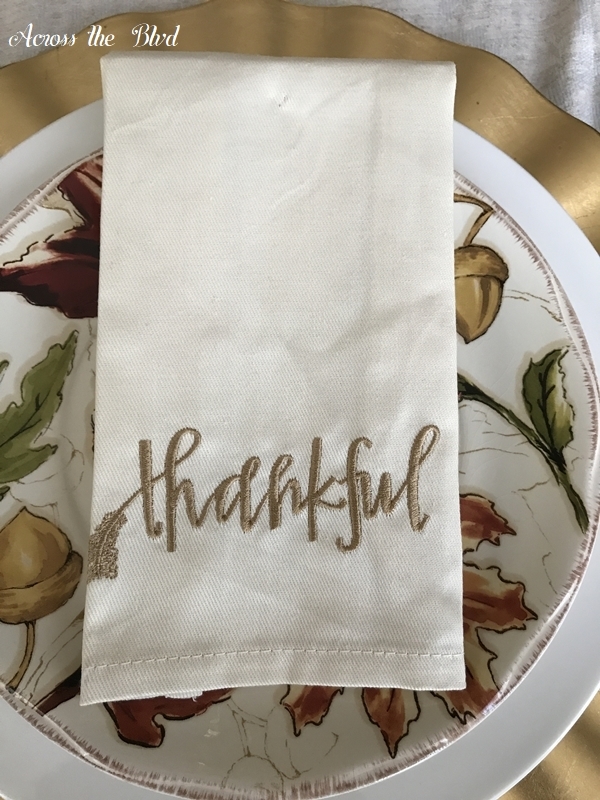 I love these napkins that I found at Tuesday morning recently. The neutral color with the gold stitching is perfect for this look. 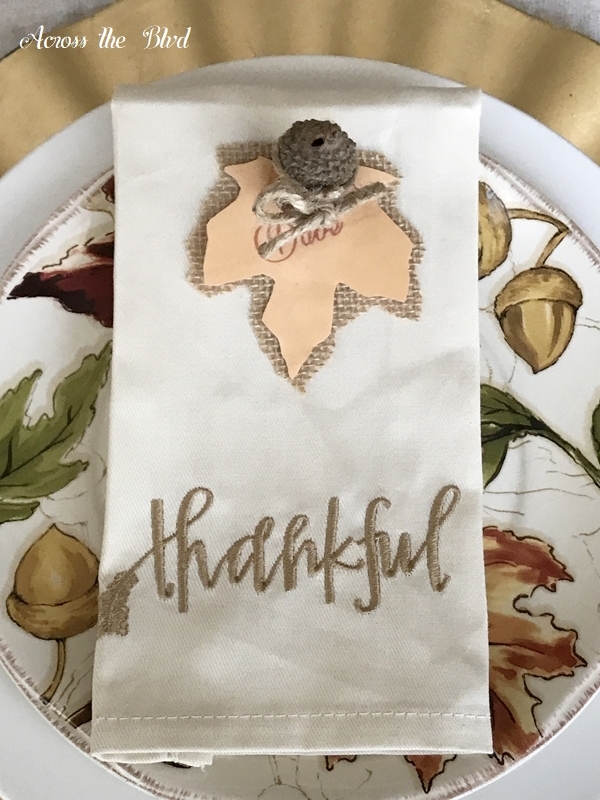 The napkins are topped with the DIY acorn and leaf place card. 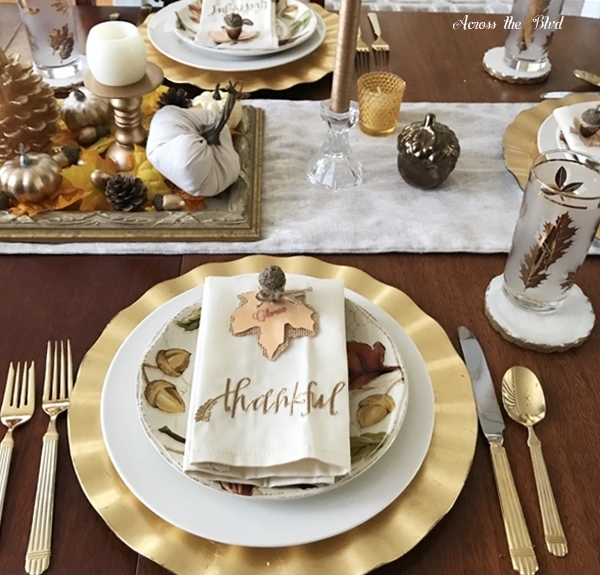 I didn’t set out to have a leaf theme for my Thanksgiving tablescape, but as I added pieces that’s what it became. There will be only six of us for Thanksgiving, so there is plenty of room on the table for decor. 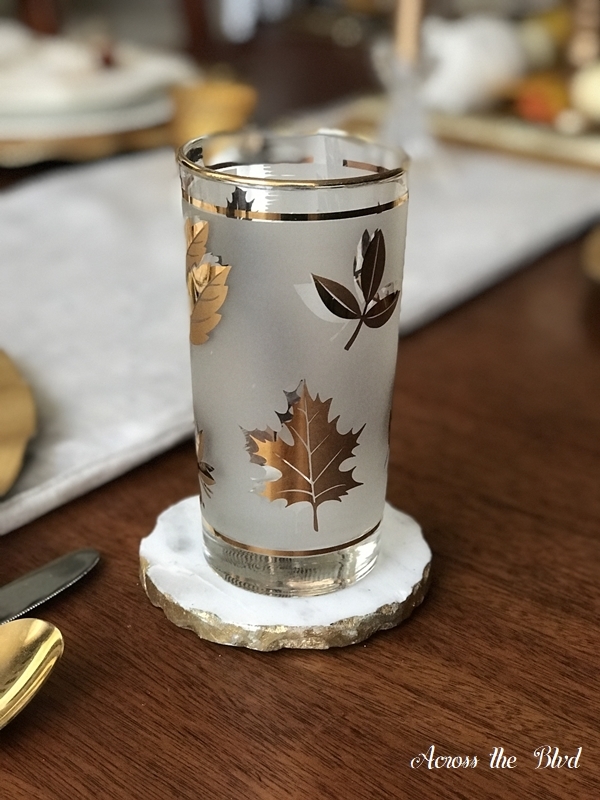 The mid century Libby Gold Leaf Foliage Glasses are always perfect for an autumn tablescape. 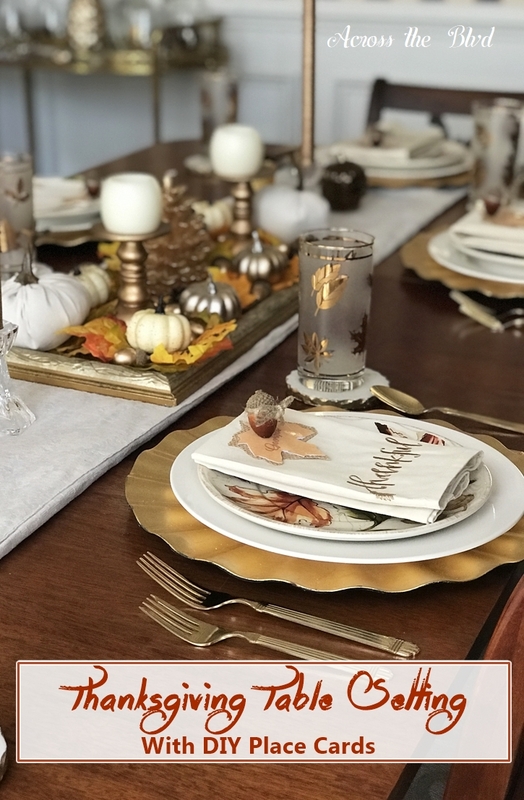 I’m using the Simple and Budget Friendly Fall Decor that I shared a several weeks ago as our centerpiece. I swapped out one of the fabric pumpkins for the gold pine cone candle in the middle. Gold tapered candles and small gold votive holders add to the overall autumn look. 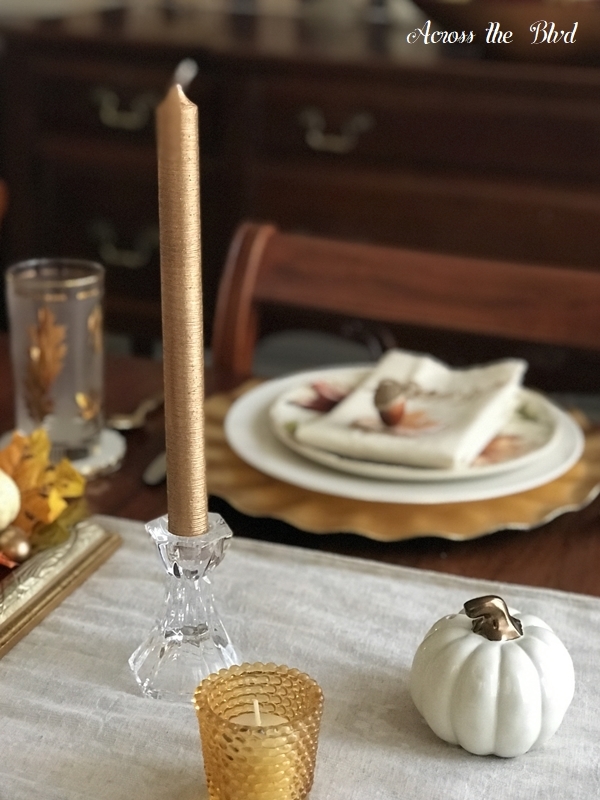 The glass candle holders were Goodwill finds and the gold votive holders came from Party City. The pumpkin salt shaker has a matching acorn for pepper. These were purchased at Walmart last season. I’m pleased with how it all came together and I was especially pleased that I used items I already had on hand to get a new look for this year. The only new purchases were the acorns and the napkins. With all of the expenses of the holiday season, it’s great to find ways to save! What a beautiful table setting, and I love those name tags. Such a fun idea! When I seen those acorns I thought wow those are the pretties acorns I’ve ever seen, then I read that you got them at Joanna. Lol. Thanks so much, Linda! The place cards were super easy to make. Those acorns would be pretty perfect to have found outdoors! 🙂 The glasses are some of my favorite older pieces. Beautiful tablescape. You have a great eye for detail. the acorn held place cards are so creative. Pinning. Thank you, Sharon. I do like to give attention to the little things. 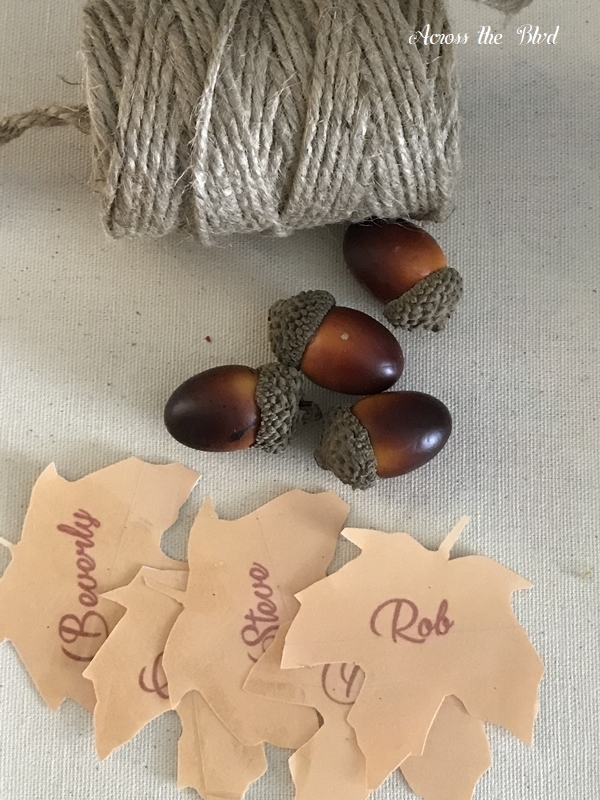 The acorn place cards were easy to make! Thanks so much for pinning. Oh, it’s fantastic how every little leafy detail came together so perfectly! Love the burlap/paper combo place cards with the napkins! And your dishes and glasses go together perfectly! Thank you, Florence! I was pleased with how the look came together, too. 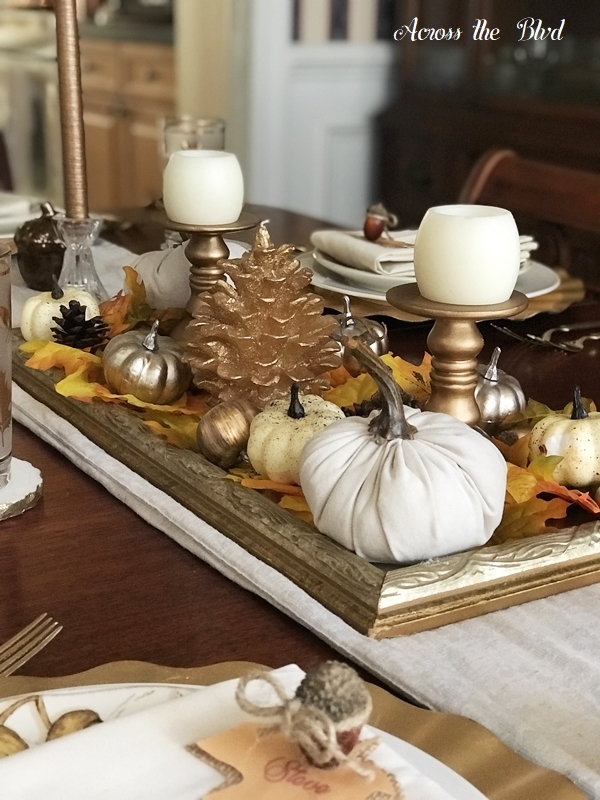 Those old glasses are favorites of mine and they go so well with a fall tablescape. I’m happy to have found them years ago. Beverly, The table setting is lovely and the place cards are a simple but very elegant addition! Pinned and shared! I was happy with how the place cards turned out, especially considering they were put together without a real plan to start with! 🙂 Thank you and thanks for sharing! Using clear packing tape to laminate the place cards is very creative. I love your table and thanks for the inspiration. we hope to see you again next week at celebrate your story. Thank you, Sandra. Being a former teacher, I want to laminate everything made of paper! This was a pretty good alternative. Thanks for the party each week! Absolutely beautiful table Bev. I love the place Cards with the Acorn, but the salad plates and glasses are everything. Thanks for sharing on Sunday’s Best. Thank you, Rhonda! I love those glasses, too. It was a fun look to put together. Thanks for the party each week! Hope you have a wonderful Thanksgiving.